Sylvia Plachy takes the stage on the first of three days at Look3 - Festival of the Photograph. Look3, the Festival of the Photograph, held for the past two years, enters its' third year this week, June 11th through 13th, in Charlottesville Virginia. A remarkable celebration of photographers, their images, and stories, are on display in galleries around town, as well as on stage at the Paramount Theater each evening. At right is a crop of the brochure for the World Copyright Summit, held June 9th and 10th 2009 in Washington DC. What is remarkable is that, while a photographer is an iconic visual representation of copyright on their brochures and website, not a single photographer, illustrator, or, as Robin Gibb pointed out, painter, is on the program for the Summit. 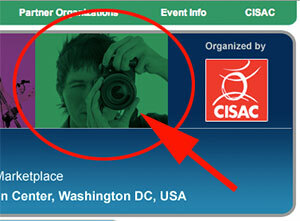 Further, not a single photographer's trade organization was in attendance as a delegate (we asked the registration team there), so we put the question to the organizers of the event, CISAC, and asked Robin Gibb, their President, to help us understand how this happened. It was suggested that organizations like the Copyright Alliance, which was in attendance, collectively represents those creators, as they have photographer associations as members. However, to not have a single photographer, illustrator, or painter on stage, while the vast majority of other creators were, seems rather odd. See if you can discern the answer Gibb gave us, as we asked, and re-asked the question. At the World Copyright Summit, held June 9th and 10th 2009 in Washington DC, Michael Heller, Columbia Law School professor and author of the book The Gridlock Economy, was a featured speaker. Following his presentation, he took a few minutes to discuss with Photo Business News some additional thoughts about copyright, orphan works issues, and issues of private property rights as compared to societal rights and needs. The World Copyright Summit, held June 9th and 10th, 2009 was a who's who of organizations and individuals with a wide array of perspectives on copyright issues. Gigi Sohn, President and co-founder of Public Knowledge, a Google-backed organization, shares her perspective on copyright issues, and Orphan Works. Last year, we reviewed a number of Public Knowledge's statements about Orphan Works - Orphan Works - A Unique Set of "Myths" and "Facts" (6/2/08). Orphan Works - "in the coming weeks"
During the World Copyright Summit, Sen. Orin Hatch (R-UT), gave the keynote address on the first day of the event, held here in Washington DC at the Ronald Reagan Building. During the address, Sen. Hatch stated that he was actively working to get orphan works legislation passed this Congress. I also continue to be very active on passing orphan works legislation. 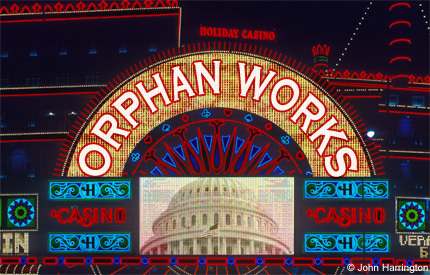 Last year, the Senate unanimously passed bipartisan legislation to encourage the use of orphan works - works that may be protected by copyright but whose owners cannot be identified or located. Countless artistic creations - books, photos, paintings and music - around the country are effectively locked away and unavailable for the general public to enjoy because the owner of the copyright for the work is unknown. Unfortunately, it often isn’t easy to identify or find these owners of copyrighted work. To make matters worse, many are discouraged or reluctant to use these works out of fear of being sued should the owner eventually step forward. It could reasonably be expected that the bill that is re-introduced will be identical to the one that passed the Senate last session, and then all eyes will turn on Chairman John Conyers. Back in January, at the start of the 111th Congress, we wrote 111th Congress - Orphan Works Futurecast, which details Conyers' past positions as very Pro-IP. With The President having both Houses of Congress, whatever final bill will have to have the blessing of the President. We detailed our reading of the tea leaves as it regards President's position at the same time, in Orphan Works in the Era of Obama. It isn't likely that bills will sail through Congress and become law before September, but with a Senate bill dropping in the next few weeks, it would be very probable that the House would hold hearings during the early Fall. Is Photo District News guilty of "passive raciscm" in their latest photo annual? In a word, no. What started (here) as race-baiting, evolved into money-grubbing race-baiting here, with a well honed charge that PDN's photo contest is passively racist because their jury is all white. I have been critical of PDN's past photo contests (No Confidence Vote for the PDN/NGS Contest, (1/28/08), but this charge is just outright asinine. 1) By having a jury that looks all white, these individuals will select or be pre-disposed to selecting white photographers, white subjects, or issues predominantly of interest to whites. 2) They should have been actively racist in saying "hey we need a _____ guy or a ______ woman here to round out the color spectrum for our judges." 3) That, independant of race, judge(s) "of color" were asked to judge not for the color of their skin but their stature in the industry, and could not do it, for whatever reason. Premises 1 and 2 are actively racist, as compared to the initial charge which suggests passive racism, and premise 3 results from the lack of actual knowledge of the inner goings-on of the contest, and is an assumption by critics. The judges didn't have a headshot (or likely even a name) associated with each entry during the judging. Judges don't say "hey, all our entries are about the good in the world as represented by white people, we need some black and asian plight to offset that good so our contests' winning entries appears balanced." Unfortunately, this charge deserved to stay on the backpage of the Weekly World News, and instead, was brought into, for lack of a better way to put it, the mainstream blogosphere by A Photo Editor (here), so I felt it necessary to put forth a response as well. A silly $1k offer, is the best money the critic will never have to spend, in order to get this type of charge out of the backwater where it should have stayed. An era has arrived when people are largely judged by the content of their character, and not the color of their skin. Does racism remain? You bet. Whites can be racist, just as well as blacks, asians, hispanics, and so on. We will never eradicate all racism. Bush's trusted Secretarys of State? African American, alonside other races in other cabinet posts. Obama's trusted VP and cabinet officials too cross a spectrum of race, and in both administrations, race was not a factor. 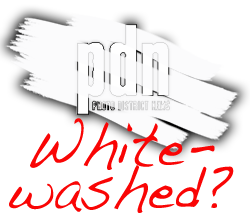 PDN is neither actively nor passively racist. Further, neither are the judges.